This fancy manor is the main location of Black Butler, where most of the story takes place and the main cast of characters all live and work together. Located in the mist-covered outskirts of London, this large home has only ever been destroyed once in its entire lifetime; Ciel Phantomhive’s 10th birthday party when a fire burned the place down and killed Ciel’s parents. From being attacked by circus freaks to a closed-door murder happening right in one of the bedrooms, the Phantomhive Manor has seen it all. It survived its destruction due to the impeccable skill of Sebastian the demon butler, and its small staff are so messed up in the head, they’ll barrage you with bullets and explosions should you ever decide to intrude without permission. I love how English it is. It’s taken several years for the manor to go back to fully functioning, despite the stupidity of the staff that aren't demonic butlers, but the Phantomhive Manor is considered one of the greatest buildings of England. We still don’t know why or how the manor was first destroyed but considering it involved the death of two wealthy people and caused Ciel to be kidnapped and sold immediately afterwards, we know it’s not for the “greater good”. There are many alien planets in fiction, but not one little boy or girl who knows anime or even Saturday mornings should not be aware of the famous battlefield where Goku and Freeza had their infamous battle for the title of “Strongest in the universe”. 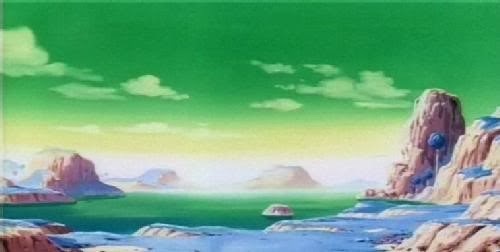 Once home to the Namekians, which are basically a green type of alien that are famous for creating the well-known Dragonballs in the first place, this planet was once a peaceful and hugely populated one. After some hard times, the population shrunk considerably but still managed to live on as farmers, warriors or healers. This species is also known for having one of the greatest characters of the Dragon Ball series, Piccolo. Eventually, Freeza arrived in the hopes of obtaining their Dragonballs to wish for immortality, but thanks to Vegeta, Gohan, Bulma and Krillin that plan ended up in shambles with tons of Freeza’s elite forces defeated. When Freeza finally joined in on all the brutal fighting, he wrecked the place until Goku arrived. This fight was so chaotic, that it’s amazing the planet actually survived as long as it did. Welcome to Death Weapon Meister Academy! Where students of the world learn to transform into weapons of pure power and are called Weapons and then partner up with another student called a Meister to befriend and preserve peace, via slicing up evil souls of murderers who died years ago. Founded and owned by the Grim Reaper himself, this academy has every main character in their surprisingly casual lifestyle. A clever twist on the horrors of school. Whether it’s learning general knowledge about souls from a mad scientist who would rather dissect the most valuable creatures on earth, or being tested by a deceased zombie teacher who tries to kill you with his own tombstone, there seems to be something for everyone to do. Other members of staff include a witch called Medusa who’ll treat your wounds and corrupt your own soul. Considering the chaotic nature of every member of staff, it’s amazing any of the students are normal, although “normal” is a bit of a stretch, considering how one is a more annoying ninja than Naruto, one is the son of the Grim Reaper who cries about the lack of symmetry and one is so silly and stupid she used her test papers to create a toy giraffe and then proceeded to break its neck. 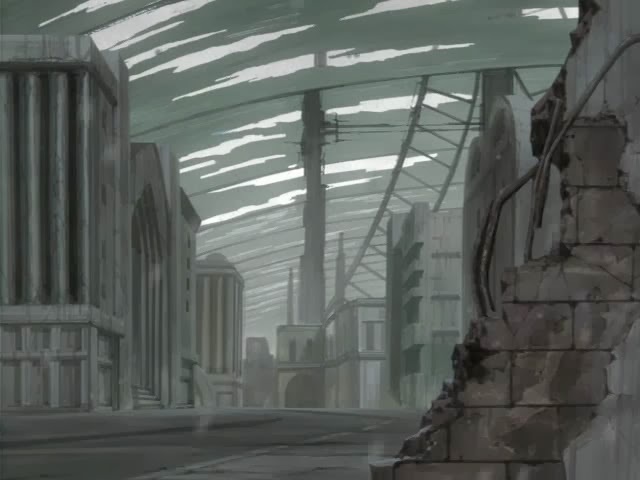 Due to being ravaged by the after-effects of a nuclear war, the Earth that we see in Wolf’s Rain is more than a little different to the one we know (and that’s not even including the talking psychic wolves). Most humans live in huge, enclosed cities that are beginning to decay, and poverty and hunger are rife. And that’s inside the cities. Outside is even worse, with dead forests, destroyed towns, massive deserts and deadly dust storms. So not a place you’d like to visit on your holidays, then. Despite this, Wolf’s Rain manages to squeeze a huge amount of variety out of its locations, and the scenery is always spectacular. Snow-covered wilderness? Check. Ice floes? Check. Petrified forest? Check. 1984-esque city? Check. Most of the scenes that take place in human settlements just emphasise the poor quality of life, as food, water and fuel are incredibly hard to come by. The only place that averts this is Jagara’s City, and even then it’s heavily implied that life there isn’t much better. Whilst this does instil a sense of despair and hopelessness, this only serves to make the wolves’ search for Paradise that more necessary and exciting. Due to the fact that pretty much the entirety of the FMAB storyline takes place in Amestris, it’s not a huge surprise that it’s on this list. A large country with a lot of geographic diversity, it’s completely bordered by other countries such as Xing and Drachma. Even though a significant portion of the action takes place in the capital city, the other areas of Amestris get a decent amount of screentime, as Ed and Al travel from the vast desert of the East to the snow-covered fort at the North of the country. The smaller settlements also appear fairly regularly, with the canyon town of Rush Valley and the rural town of Resembool, home of the Elric brothers. At least the street layout is sensible. Amestris is also unique in that only its inhabitants can use Alchemy. Whilst people native to Xing can use a similar technique called Alkahestry, it’s explicitly stated to be comparable to Alchemy, but fundamentally different. As such, characters like Scar and May Chang can continue to use it even when the Alchemy that Ed and Al use has been negated by the main villain of the series. Despite this, even characters that are incapable of using Alchemy are still competent fighters, like Olivier Mira Armstrong and Lieutenant Hawkeye. It’s time people started reading this series and I intend to get people hooked. 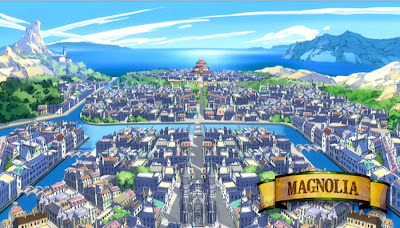 With the fantastic world of Magi, filled with magic, corruption, poverty and more, I had trouble choosing which city or location would be best for this list. 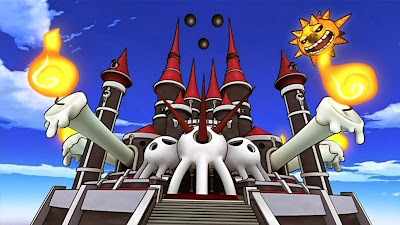 I have gone with Balbadd because it’s one of the most important cities and it is the location of my personal favourite arc: The Balbadd Arc. To avoid too many spoilers, I’ll keep this short. 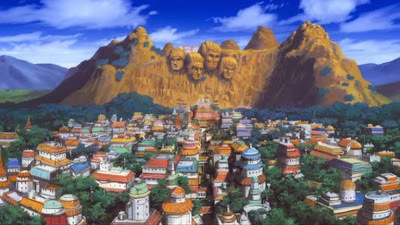 Birthplace of one of the main characters, Alibaba Saluja, this city has seen its fair share of poverty for many years. Unsurprisingly, the king does very little to help this, and has probably caused a large portion of its slow downfall into destruction. Why aren't you loving this series?! Turning good people into insane rebels, and causing children to lose their freedom to the hands of slavery, all the king cares about is money and will gladly sell the residents of Balbadd to get it. 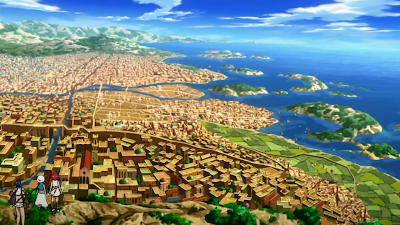 For Alibaba, this city is tough because he has to watch as his own home and family battle against each other and sink into pure corruption, losing what once made them good people. This once great city needs its freedom returned to it, and that is what Alibaba and his friends, Aladdin and Morgiana, intend to do for it. Given that the main setting of Durarara!! is based on a real-life district of Tokyo, you may be wondering why Ikebukuro is so high up on this list. In fact, it’s because it’s based on real life that it’s so high. Simply put, the attention to detail the animators put in is amazing, to the point where the vending machines that get thrown around by Shizuo Heiwajima actually exist. It’s one thing to be accurate, but doing things like adding in real-life vending machines just takes it to the next level. The living, beating heart of Ikebukuro. Not literally, of course. That would be disgusting. The other really good thing about Ikebukuro is that it actually feels like a bustling, thriving city. 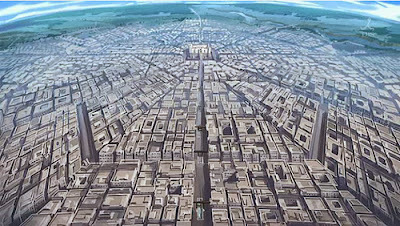 In other anime series set in cities, like Steins;Gate and parts of Baccano!, the cities just don’t feel alive. Most times, the streets will be empty except for one or two people, and there won’t be much traffic. In Durarara! 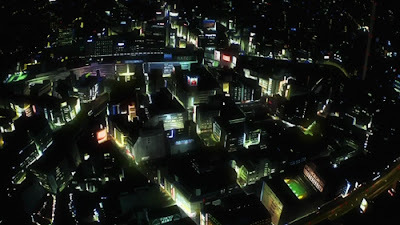 !, it seems like they went out of their way to avoid this, as every street and location is filled with people (even though they’re only really grey silhouettes), and the occasional aerial view really helps to make Ikebukuro seem that much more vibrant and alive. 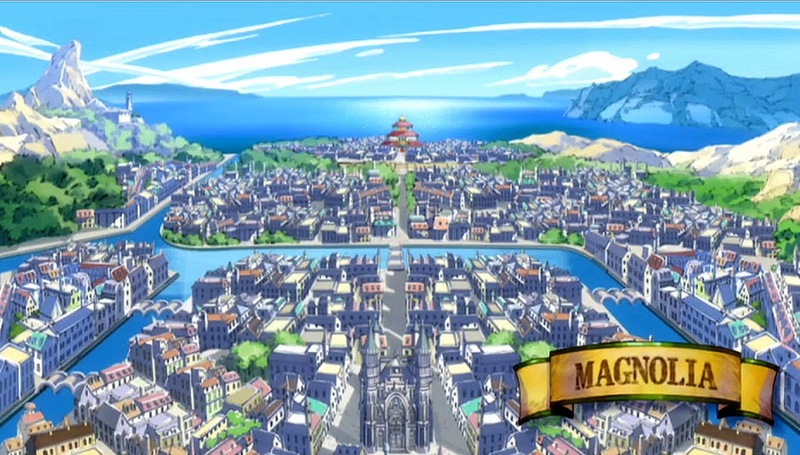 The home of the Fairy Tail wizard guild, it’s no surprise that the coastal town of Magnolia gets featured quite a lot in the anime. With architecture resembling that of medieval homes, the entire town is built around a cathedral (that Natsu and Gajeel managed to damage during their fight with Laxus). Perhaps the most defining feature of the town is the Fairy Tail guild itself. 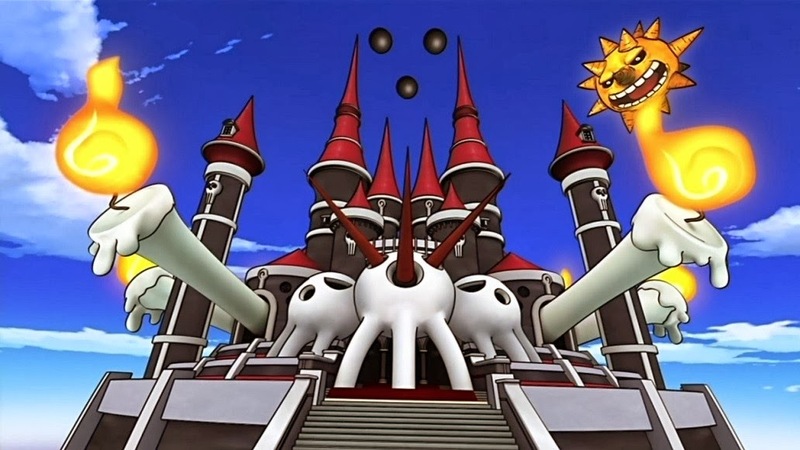 At first, it resembled a pagoda, but when it was destroyed during Phantom Lord’s attack, it was rebuilt in a fashion more reminiscent of a traditional castle. One of the main features of Magnolia is known as ‘Gildarts Shift’. As the name implies, it happens whenever Gildarts Clive is returning to his guild. Due to his extreme absent-mindedness and his type of magic, he can pretty much walk through houses without noticing, destroying the building as he does so. In order to prevent this from happening, every building in the town is fitted with mechanisms that allow them to rise and move to the side, creating a direct path from the town’s entrance to the Fairy Tail guild. Say what you like about Magnolia, but it’s one of only two towns I’ve seen that can move. When people die in the Bleach universe, their souls end up in the Soul Society, a massive city that houses everyone in the afterlife. Despite being labelled as idyllic and compared to a paradise by Rukia Kuchiki, the reality is somewhat different. Most souls go on to become Soul Reapers, and join one of the 13 Court Guard Squads. 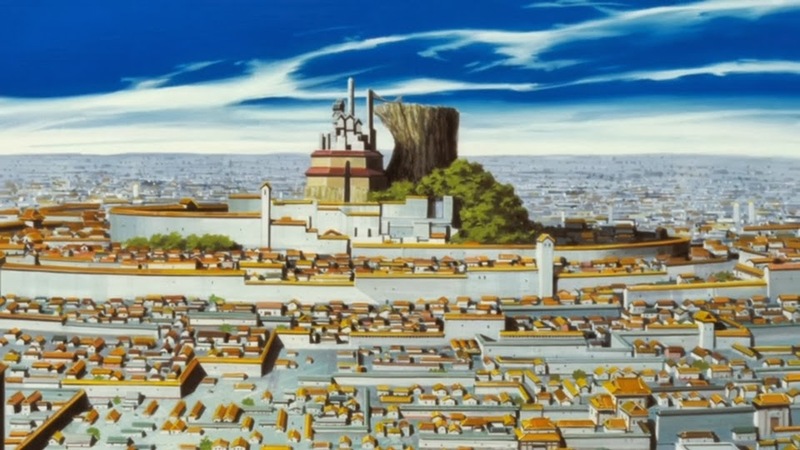 The Soul Society is split into two sections – the Rukongai, where souls live when they first arrive, and the Seireitei, which houses the living quarters and training areas of the Gotei 13, along with the Central 46 compound. I hope they have a good public transport system. The Seireitei is dominated by the Senzaikyū, a massive white tower that houses criminals that are due to be executed. In times of invasion or emergency, walls can fall down from the Soul Palace to protect the Seireitei (but they’ve never successfully stopped anyone). The entirety of the Soul Society is built in a style similar to feudal Japan, and this extends to the way of life of its inhabitants. Oh, and there’s an army of Quincies hiding in a pocket universe inside every shadow in the Seireitei, waiting for the right time to burst out and invade the Soul Society, killing everyone they come across. But we don’t like to talk about that. Was there ever any doubt? With all the great locations in this list, none are as resilient, unique or fun as Konoha itself. Ironically placed in the nation known as the Land of Fire, this Village Hidden in the Leaves is the home of many great ninja clans including the Senju, the Sarutobi and the Hyuga. 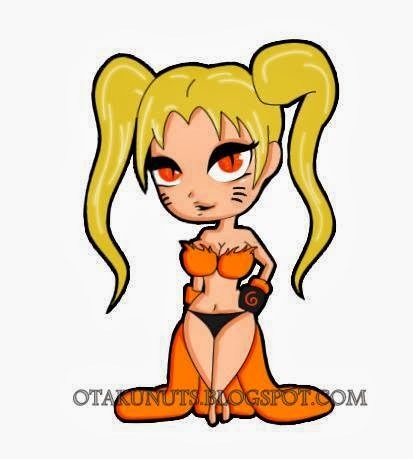 This is also the birthplace and home of Naruto Uzumaki, the titular character. It’s been invaded twice in the past ten years but it has always managed to stick around, albeit now currently in a shadow of its former self due to the destruction that was caused by Akatsuki member Pain. Konoha is instantly recognised by its large monumental mountain, which shows the faces of every leader the village has ever had, also known as the “Hokages”. With almost every resident of this town a Shinobi that dreams to be Hokage, times are always challenging and exciting, with Shinobi constantly taking on new and exciting jobs in locations all around the world. Rising through the ranks by taking a famous exam which consists of battles and challenges is only part of the reason this village is so tough and fun. That, and the design of it is absolutely amazing and traditional. ClayDragon is currently studying Physics at university, and is constantly bewildered by it. The main method of contacting him is his Gmail account at kyleroulston1993@gmail.com. The alternative is his Skype account at kyleroulston1993. When not playing games or reading, he can be found with his head in his hands whilst trying in vain to understand quantum physics. El Psy Congro. Again…again with Bleach near the top number…It’s like you’re trying to oppose me(lol). Namek is cool, but it has problems, like everywhere looks the same. But Namek is the perfect place for Toriyama to throw around huge explosions. The residents were dead anyway. When they returned to Earth, there wasn’t any more huge feats. I mean, you never see Cell blow up a planet. Soul Society is… an example of Kubo not thinking through his ideas, plot and setting. Not counting the time Kubo should have spent thinking before publishing, he had a year of serialization before the Soul Society arc. SS is a mishmash of ideas that never went anywhere and were poorly thought through. Now, learning another language is hard, but Kubo seems to know Spanish and German. But Spanish is reserved for Hollows, which are...impure spirits... Is Kubo implying only Japanese are pure? "Seireitei" actually means "Court of Pure Souls"! Here's the second problem, the government and the law is totally unfair. When people die, they are sent to the Rukongai, the districts surrounding Seireitei, which you can enter if you have high reiatsu. And you don't want to live in the Rukongai. You don't know where your family is, the houses are slums, and you are completely open to hollows attacking. Of course the shinigami can protect you, but they are stuck in Seireitei, living nicely, and they have huge walls keeping the souls out! The houses are slums, but the quality of the houses increase as it gets closer to Seireitei. That's like freaking North Korea! And there is elitism in SS. How? How is there 4 Noble Clans in the afterlife? How do dead people have children? But aside from Byakuya, we never see most of the clansmen. I would say Kubo never thought about it, just like his 4 levels of secrets, but if we assume he did, we can say they're not Shinigami. So they live greatly, these upperclassmen, while the middle-classmen are Shinigami, while the lower classmen are in slums. Oh, and there's a Spirit King. And the Captains are evil! Byakuya is a snob, Kenpanchi is insane, Mayuri tortures people, and uses his subordinates as bombs, nobody noticed Aizen, Yamamoto doesn't do anything about this and is willing to sacrifice the Gotei 13 to defeat Aizen, and against Bach summons his dead Quincy soldiers to fight him, Yamamoto wiped out his race and he takes the moral high-ground?That's no better than the villains! But actually, this would make for good villains. Weren't they bad guys in the SS arc? And now they're randomly buddies with Ichigo? Kubo has no idea what to do with them! Oh and I mentioned the crap law in another comment before, they imprison people (e.g. Mayuri) for no reason because they THINK they are dangerous, Urahara was framed and was banished to set a secret shop named Urahara Shop where he gets shipments from Soul Society, and they will release Aizen in a few thousand years! And yeah, Konoha has child soldiers but compared to villages like Kirigakure, they're pretty nice about it. With regards to the Soul Society, it is a crappy place to live, although I suppose it is better than being dragged off to Hell. The diversity thing is a good point, and it's something I never really considered. The best explanation I can think of is that your soul goes to a different place depending on your nationality. Either that, or your name gets changed when you die, and for whatever reason everyone is given Japanese names except Sui-Féng (this would probably work for Hollows/Arrancars too - I doubt anyone in the world is called Barragan Louisenbairn or Grimmjow Jaegerjaquez). And I think Hiyosu was a human who experimented on himself, like Akon (hence his three little horns). And yeah, the laws are unfair, but there isn't a lot anyone can do about it. Even if they set up a project or something to build homes for the souls in the Rukongai, the sheer amount of souls arriving every day would mean that the building work would soon become too expensive and time-consuming to keep doing. I would assume that the Noble Clans are similar to people who have been knighted in the real world, in that they have a snazzy title but rarely do anything. I'd say the Captains aren't evil per se, just neglectful. Except Mayuri. Mayuri is flat-out evil. Yes, Byakuya is arrogant and stuck-up, but he's still a good guy. Kenpachi is slightly harder to classify, but considering he's fighting the same enemies as the Soul Society, I'm going to tentatively label him as a 'good guy'. Yamamoto seems more of an 'ends justify the means' kind of person. I think Mayuri had proven his dangerousness, hence why he was arrested, and Urahara was framed (although the fact that Yoruichi broke in and helped him escape probably didn't help matters). 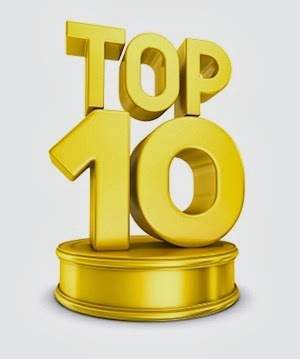 If SS is such a crappy place to live,why is it #2? Hell has not appeared since Chapter 12, so Kubo probably forgot about it.Why isn't Tsukishima in Hell? Changing your name when you become a soul/hollow is still a silly idea. "Now that I'm an evil ghost thing, I guess Bob isn't a good enough name. I've always liked Mexican food... how about Grimmjow?" Then again, the Quincies seem alive, and one of them is named NaNaNa. I guess Quincy parents are high whenever they name their kids. You can get the dead people to maybe, move in to the mostly empty Seireitei!? Or get the souls to build better houses? I'm sure they'll be glad to get out of slums. At least the knighted in this world are famous for a reason, the 4 Great Clansmen simply inherit their title and don't do anything. SS has no reason to consider them great. Why do you have clans when you're DEAD?! Mayuri was arrested before he did anything, because SS "thought" he was a threat. Then Urahara let him go free, and then Mayuri started using Shinigami-Bombs. Of course, Soul Society hasn't arrested him after that. If Kubo at least acknowledged the crappiness of SS, then it would be better.